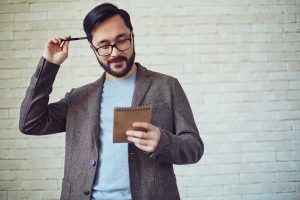 It’s one thing to write website content that’s interesting and communicates your brand’s message—it’s another to grab your reader’s attention. That’s where well-written headlines come in. Eye-catching headlines are critical to your content’s success, and they’re sometimes an art form to create. Your very first headline—your blog title or H1—grabs your reader’s attention when seen in search engine results. It must stand out from the rest to get that all-important click through to your website or blog. Also, did you know that 55% of visitors read your blog articles for 15 seconds or less? And your website content is read for less time than that. Good headlines strewn throughout your content helps readers who skim find what they’re looking for easily and quickly. Writing catchy headlines for your content doesn’t have to be hard. All it takes is a little bit of strategy and a lot of creativity. A flowery headline that works as “clickbait” for your audience won’t do any good for conversion. Although you want to grab your reader’s attention, it’s important to stay accurate. Use your headline to quickly state what the content to follow is about. Whether it’s a blog post or a section of website content on your Home page, make sure your reader knows exactly what they’re getting ready to read. Strong words: Use strong words such as “fascinating” to add flair to your headline. Remember to use these words in moderation. Use visual tools: According to HubSpot, headlines that feature the word “photo” performed 37% better than headlines without the word. If you use photos within an article or blog, make it known in your headline. Keep it short: Long headlines are tedious to read and understand. Remember that long titles will be cut short in search engine results. So, keep your headline short and simple, focusing on delivering the topic quickly with personality. If one thing is true, it’s this: your audience should be the reason behind most of your content decisions. When it comes to your headlines, make sure you consider what your audience will be looking for. Headline preferences will differ between different demographics such as age. For search engine optimization purposes, your content should have a focus keyword that helps explain the topic. That focus keyword should be placed in your heading in a natural way. For example, the focus keyword for this blog post is website content. That keyword is in the title and necessary for you to understand what this blog is about. What headlines catch your eye? As you’re scrolling through Google, take note of the headlines you often gravitate to and save them. Whatever you do, don’t copy! Instead, use those headlines as inspiration for your own. Still Need Some Help? Call Us! Are you struggling to write headlines that make sense and catch your audience’s eye? Want to take your website to the next level? We can help! Reach out to our team at Iceberg Web Design by calling 763-350-8762 or send us a message online.